SOLD $370,000 2 Day Living Estate Auction!!! - 3 BR, 2.5 BA Home w/ Separate 2 BR Apt. 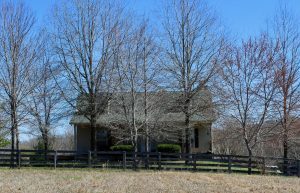 & Barn on 6.54 Acres & Personal Property | Middle Tennessee Real Estate :: Maples Realty & Auction Co.
RARE OPPORTUNITY!!! 3 BR 2.5 BA home with separate 2 BR apartment and barn on 6.54 acres. Home has large covered deck, 2 car basement garage, fenced and cross fenced. Conveniently located, less than 2 miles from downtown Nolensville, minutes from 840, I-65, Franklin, Downtown Nashville, shopping, dining, and great schools. The owner has been picking for over 60 years. The Personal Property includes: Furniture: Rocking chairs, speaker cabinets, dresser, brass bed frames, and cabinets. Antiques: Pewter silver plates from the 1800’s, vintage sewing machine, doll chest, and sickles. Houseware: Oil lamps, pictures, decorations, stained glass window, china, serving utensils, Vaseline glassware, Flow blue platter, sterling silver, Franciscan dinnerware, sugar shakers, Nippon china, Wedgewood China, occupied Japan glassware, vintage chess set, carnival glass, Granite Ware, Bristol Ware, cast iron pans, mason jars, fireplace screen, fish statue sailfish, bakers rack, slate art pictures, wicker baskets, English lusterware, and Royal Doulton mugs. Tools & Yard: Kennedy box, tile saw, miscellaneous hand tools, table saws, drill presses, compressors, grinders, band saw, electrical wiring, shop vacs, various surface plates, granite plate, lapping plates, blowers, electric chainsaw, various hardware, mule harness, gas cans, cabinets, garden tools, Cub Cadet riding mower, Troy-Bilt riding mower, weedeaters, garden tiller, push mowers, pressure washer, battery chargers, ladders, chains, chain hoist, and trunks. Miscellaneous: Camp trailer, Hustler slolum ski, books, vinyl records, wreaths, jewelry, vintage tackle boxes and lures, large sign, wrought iron vintage patio set, stainless steel outdoor sink, lumber (black walnut, cedar), chandelier, old wood stove, fireplace andirons, fans, spiral staircase and much, much more. Directions: From Murfreesboro, HWY 96 to right on Nolensville Road/Hwy 31A/41A Property on right; From Franklin, Hwy 96/Murfreesboro Rd to left on Nolensville Rd property on right. What type of payments do you accept for personal property purchases, check, credit cards (if so, which ones)? Thank you for your response! Can one bid online for the personal property? No, this auction all of the personal property will be sold live. I believe they are starting with glassware on Friday and will sale until it gets dark. The next day we start back at 10 am. and go until everything is sold. When can the property be previewed before the auction? There is not a preview date set, so you will need to call the auctioneer, Brad Muse at 615-405-5514 or Taylor Walters at 760-835-5026 and hopefully they can schedule a time for you to see it. Is there a starting bid amount for the house? The starting bid will be whatever the first person starts the bidding at. I believe there is a reserve price but the seller and auctioneer will determine at the end of bidding if it is met. Rain or Shine. I understand they are calling for some heavy weather Friday in the Nashville area. It’s looking like the worst of it may be on Thursday and stop by 3:00 on Friday. We’ll be watching the weather and obviously if it’s really bad we’ll make a decision whether we need to make a change. If it’s raining, we’ll be going on with the auction under a tent. But if it were to get really windy or lightening, we would obviously not want to put anyone at risk. Do you take absentee bids? We ended at 6:00 Friday night but will start back on personal property at 10 am on Saturday. At noon the real estate will be auctioned off. After that, we will start back on personal property until we sell everything. Is personal property being sold on Friday 1st? Yes, we will begin with personal property on Friday … probably starting with glassware and housewares. The rest of the personal property will be sold on Saturday and the real estate will sell at around noon.